Over the past few months, I’ve become convinced all survivalists should invest in gold. I wasn’t always a strong believer in investing in precious metals like gold. But based on my observations, it’s one of the smartest things preppers can do. And not just for long-term survival. Sadly, most survivalists put off investing in precious metals until it’s too late. I understand why survivalists aren’t investing in gold. The fact is investing in gold and silver can be tricky. And because it’s complicated most people avoid it. Honestly, I don’t think that should stop you from investing in gold. In fact, I think that’s a really stupid reason not to invest in gold…. I know that sounds harsh. However, considering how gold could make your life much, much better I think you should invest in gold ASAP. And that’s why I wrote this blog post. Over the past few years, my opinions on investing in gold have changed. And the more I’ve learned about investing in gold (and the more valuable gold becomes) the more I recommend it. Read this blog and you could use the information inside to become rich! Want a FREE hardcover book on gold investing? Get yours rushed to your door today! The sad truth is quite a few prepping experts don’t think survivalists should invest in gold. They think precious metals are useless and won’t keep you safe in a crisis. Well, I hate to burst their bubble… but in most cases they’re dead wrong. I can only think of a few crisis situations where gold might be worthless. And I’m not sure we’re ever going to see one of them again. Let me be crystal clear, gold has been used as a currency since the beginning of recorded history. And that means it will continue to be trusted for financial use for thousands of years onward. The only time I would imagine gold becomes totally useless is if all survival supplies were wiped out and things like food and water were in short supply for years. Then gold might not carry the same value. Of course, events like this are so rare, so infrequent, I can’t even think of one off the top of my head. But I can say without a doubt almost any possible crises we’ll encounter will make gold more valuable, not less. Surprisingly, that’s not what I wanted to talk about today. The truth is I don’t think relying on gold in a survival situation is the smartest idea in the world. Instead, the reason I think survivalists should invest in gold today is because of the huge sums of money you can make from it tomorrow. And I’m going to show you how to use small amounts of gold to start making money in as little as a few days. Investing in gold now could help you become very, very rich in the future. And it doesn’t take an advanced degree or hours and hours of your day to make this a reality. Top Gold Investor is giving away FREE hardcover on investing. Get it here now. Like I said before, gold is always going to have value. But I don’t think you should buy gold so you can sit on it and wait for the sky to fall. Instead, I think survivalists should invest in gold for big profits. That way you can fund all kinds of things for the future. Like buying survival food, purchasing more rifles, ammo, night visions, etc. Sounds like a pretty good reason to buy gold, doesn’t it? I think so, but I’m not sure it’s advice you’ve heard before. At least not from preppers. The problem is most other survivalists operate with a different mindset. They believe it’s OK to sacrifice well-being and financial success now so you’ll be prepared for an eventual crisis. Obviously, I believe there’s some truth in this way of thinking. If I didn’t I wouldn’t have spent so much of my life helping people prepare for the future. But over the past few years I’ve learned a basic, but often-ignored truth. You can prepare for the future while simultaneously making your life better today. And that’s why I think survivalists should invest in gold. Because a decision to invest in gold could make you quite wealthy today and help you get prepared for a crisis. As I write this gold is trading at $1,320 an ounce. The price of gold is always fluctuating up or down. That’s a good thing. If it didn’t you couldn’t make money from owning gold. To become wealthy with gold all you need to do is learn how to buy and sell gold based on market conditions. This is the tricky part about using gold for creating wealth most people don’t want to deal with. But the good news is this complicated process is actually much more simple than you might imagine. Especially when you’ve got a FREE resource like The New Case For Gold. 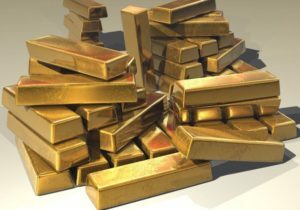 Over the past few years one of the nation’s top investors, a guy named Jim Rickards, has taught thousands of Americans just like you how to use gold to make profits. I’ve been paying attention to Rickards for a long, long time. And I’ve got to say his FREE book The New Case For Gold is one of the best resources I’ve ever seen using gold to make a fortune. When I wanted to learn how to invest in gold this is the FREE book that I picked up. If you’re a prepper who wants to use gold to get rich and to prepare for a possible crisis I highly recommend his book. It’s FREE and it could help you make tons of money (and also help protect what you already have). Super easy to read, The New Case For Gold gives you insights that make buying gold much easier than you think it is. I wish this book had been around 5-10 years ago. I might be a millionaire 10x over if it had been. The Bottom Line On Gold? All survivalists should invest in gold. That way they’re prepared for a crisis. But more than that.. investing in gold now to make money is the #1 reason to start investing. It’s a no-brainer really. Another good thing to have? An untraceable AR-15. Learn how to make one here.